So you’ve pushed past the early stages of running and been pounding the pavement for a little while now. You’re feeling more comfortable and enjoying your regular runs more and more. Now you’re feeling ready to take your running to the next level—so what should you do? 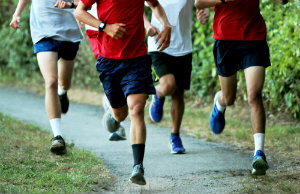 While slowly making changes to your running routines is key for improving speed and endurance, there’s a technique that all runners should be using to help improve and condition their bodies: cross-training. Cross-training combines exercises from other athletic disciplines into your regular routine. This helps work your muscles in different ways while overall strengthening your body. Your lower limbs build up power and stability all around, not just related to running. It not only gives your feet a break from repetitive foot strikes and running motions (which is important for avoiding overuse), it also makes your body stronger and more injury resistant in other ways. After all, running works your muscles in very specific ways. While this can make some parts of your lower limbs very strong, it can leave other areas more vulnerable. Some leg muscles may be more powerful than their opposites. Certain muscles or connective tissues may be prone to tightness. The sport does little for your upper body, too. More than that, though, just running the same way all the time can lead to boredom—for both your mind and your body. Shaking things up helps you get the most out of all your exercise. A well-rounded runner who wants to improve uses cross-training to “fill in the gaps” so to speak. Try biking – Biking uses many similar motions to running but without the hard impacts, giving your feet a break. Add swimming – This whole-body workout boosts your cardio and upper body power as well as your leg strength. Use dynamic stretching – Tight tissues are injuries waiting to happen, but dynamic stretching may help improve your flexibility. Consider weight training – This is a great way to increase full-body strength. Ultimately the best cross-training will depend on you and your unique needs. Let our team at Absolute Foot Care Specialists help you take care of your feet and become the best runner you can be. Call our Las Vegas office at (702) 839-2010 to get more information about foot health and running today.